A talk with Anchor Brewmaster Mark Carpenter about Zymaster Series No. 7: Potrero Hill Sour Mash IPA. Sometimes, simply taking a short walk (in this case, a walk across the brewhouse) is all that’s needed for inspiration. As Mark passed by our in-house distillery during his walk, he wondered, “If we could add in the mash from the very end of the distilling process from the Anchor Distilling team, we could lower the pH of the beer, thus adding a slight tartness to the finish of the swallow.” Just like that, sour mash from our distillery made its way up two floors to the brewhouse, and Zymaster 7: Potrero Hill Sour-Mash IPA (7% ABV) was born. 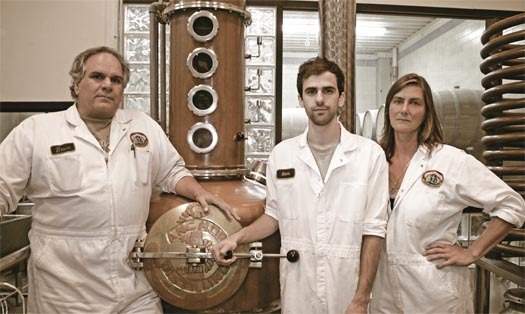 Bruce (far left), our Master Distiller, with Kevin and Kendra against a copper pot still. That sour mash contains lactobacillus, which is the “x factor” that gives this beer its thirst-quenching quality. But since the bacteria is later heated during the brewing process, it does not contribute the better-known sour/acidic flavor or slick mouthfeel that are associated with more traditional sour beers that use this bacteria as a souring agent. The mash is sour, but the beer is not. Instead, the sour mash we blend with our regular mash gives this IPA its unique spiciness. The dry tartness from the sour mash, the bitterness from the Nelson Sauvin hops, and the subtle spiciness from the rye meld together to create a singular, thirst-quenching IPA with a clean, crisp finish. Dry-hopping with Nelson Sauvin adds tropical complexity with notes of grapefruit, mandarin orange, and passion fruit. 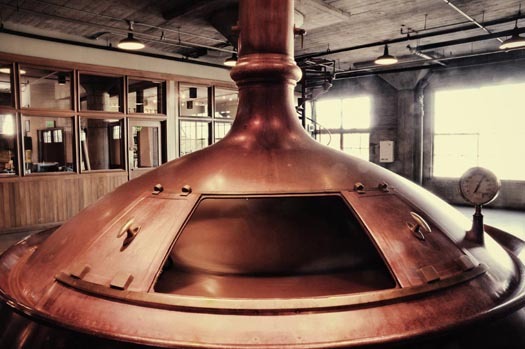 Already a pioneer in craft brewing, we moved to San Francisco’s Potrero Hill in the late 1970s. In 1993, we repurposed a small corner of our brewery and began distilling whiskey from a mash of 100% rye malt. We call it Old Potrero®. Although we’ve experimented with beer and hops in the distillery, we’ve never used rye or sour mash in the brewery—until now. This Zymaster beer begins in our distillery, where we prepare a 100% rye malt mash just as we would for our rye whiskey. After transferring it to a small open fermenter, we pitch the yeast and wait. Five days later, we mash in in the brewhouse, using a blend of pale barley malt and rye malt. We then add the sour mash from the distillery, which lowers the pH of our brewery mash. By introducing sour mash before the boil instead of after it, we are able to create tartness in this brew without sourness. Mark mentioned that the process wasn’t a strain on the brewing equipment – or the brewers – and went as smooth as brewing a beer can go. 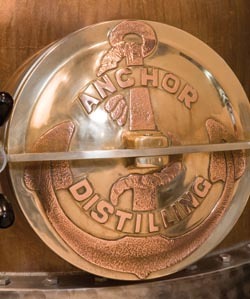 As for future Anchor Brewers & Distillers mash-ups, most definitely don’t count that out. Especially when you consider it’s only a short walk down the stairs to see what they’re up to. Read more about our Zymaster Series of special brews here, and search for Zymaster brews near you with our Beer Finder.